Every drawing element has a palette list. 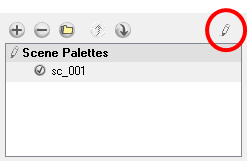 The scene also has a palette list. A palette list is a file containing all of the links to the original palette files. For example, a drawing element can use three different palettes stored in three different locations, while another drawing element can use two of these palettes plus another one coming from another scene. The palette list keep tracks of the location of the palettes. To prevent users accidentally removing a link to a palette, the palette lists are locked. To add a new link to a palette, the user must first unlock the palette list. 1. Select Edit > Edit Drawing Mode or Edit Palette List Mode. When the option is enabled, a check mark appears beside it. When in Edit Palette Lists Mode, a grey pencil appears on the top corner of the Colour view palette list to indicate that it can be modified. Before you can add, remove or modify colours from a palette, you need to have the right to edit palettes. A colour palette is an actual file that can be found on the hard drive. These palette files can be stored in a different location on the server machine. They can be stored in the Environment, Job, Scene or Element folder and linked to any palette list. This means that if the original palette file is modified, it will update in every drawing element the palette is linked to. To avoid accidentally modifying the palette, the palette files can be locked. The user must get the rights to modify them. 1. In the Colour view, click on the Edit Palette Mode button. When pushed out, the mode is disabled.